The following is the text of an IBM Data Processing Division press fact sheet distributed on January 4, 1968. IBM has built another bridge between its old and new computing systems with the announcement today of a versatile new System/360 for users of small and medium sized computers. The System/360 Model 25 joins Models 20 and 30 to offer IBM 1400-series users a wider choice in converting to System/360. It is being demonstrated to customers this week in New York and Chicago. 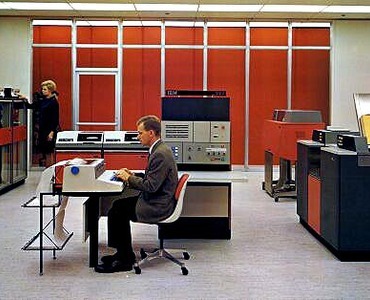 The Model 25 can operate as an IBM 1401, 1440, or 1460. It also can process a full range of System/360 Model 30 jobs, both scientific and commercial - - and users can convert to larger System/360s without reprogramming. An easy-to-use console that reduces operator training time and increases operating efficiency. The Model 25's main memory comes in four sizes of 16,000, 24,000, 32,000 or 48,000 bytes, and operates in 900 nanoseconds. The "scratch-pad' memory is designed to increase processing speeds by reducing the time it takes to store and fetch interim instructions and data during a computation. Advanced monolithic circuits in the tiny device can switch a byte (a byte is one character or two digits) of data in and out of storage in only 180 nanoseconds. Capacity of the "scratch-pad" memory is 64 bytes. IBM's designers have made the Model 25 the most compact System/360 available by eliminating separate control units for certain peripheral devices. These units and their power supplies have been built into the same frame that houses the processing unit and memories. The designers also have provided an easy-to-use console for Model 25 operators and programmers. Many functions formerly keyed in by separate buttons on the console now are entered directly through the console typewriter These include a variety of commands and inquiries, as well as job interruptions. For example, a programmer working at the console can display and alter a portion of main memory by simply typing in his instructions. The Model 25 can use a broad range of System/360 peripheral equipment, including card, tape and disk units, visual display stations, audio response units and process control devices. It also can use the wide variety of programming support that enables small and medium sized System /360s to process larger volumes of work. This includes the Basic Operating System (BOS/360), the Tape Operating System (TOS/360) and the Disk Operating System (DOS/360). COBOL is available to Model 25 programmers for commercial applications, FORTRAN for scientific applications and PL/I for both kinds of jobs. A typical System/360 Model 25 will rent for $5,330 a month, with a purchase price of $253,000. The system will be manufactured at IBM's Endicott, N. Y. plant. Initial shipments are scheduled for the first quarter of 1969.